Two-Person, Three-Wheeled Scooter Coupe | OhGizmo! I don’t know if I’d feel that safe taking something like this out on the road alongside full-sized cars and trucks, but I know I’d have fun doing it. (I’m pretty sure it’s not street legal anyways.) 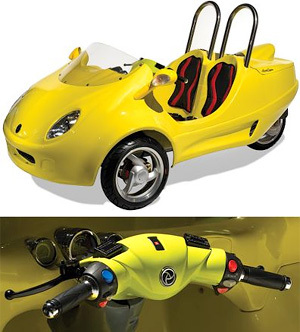 This two-person ‘scooter coupe’ as they call it has a top speed of 30mph thanks to its 50cc air-cooled four-stroke engine. When it comes to fuel efficiency it can get about 60-80 mpg, and has a 1-1/2 gallon fuel tank giving it a range of about 100 miles. When carrying two riders there’s a weight limit of about 400lbs total, and both the driver and passenger are secured with a two-point restraint seatbelt. Other features include all-wheel suspension with shock absorbers, front disc brakes and rear drum brakes, front, side and rear turn signals, headlights, folding side mirrors and a chrome dashboard with a fuel gauge and speedometer. ← Gas-Powered RC Car Reaches 60MPH!